"WORKS PROGRESS ADMINISTRATION OF VIRGINIA HISTORICAL INVENTORY"
2. 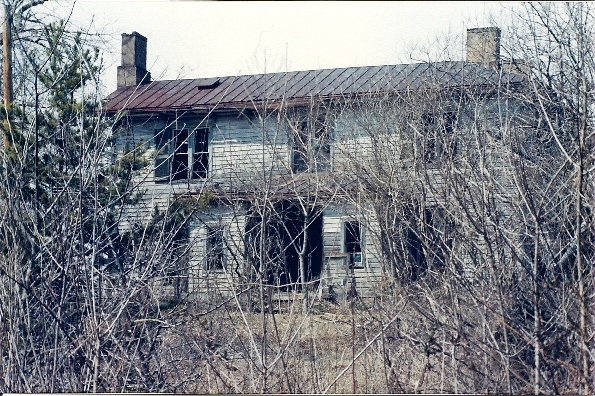 LOCATION: 10 miles south of Martinsville, Virginia, on Route #220; to Ridgeway, Virginia; thence 3 miles west on Route #687; thence 3 miles north on private road, leading to house. This is a large two-story frame house, having two large, brick chimneys, one at each side. Originally a third one was at the back but that has been removed. There is a two-story porch with large plain columns, having soapstone rests. The four panelled front door hes side-lights and transom. Originally the glass in these was colored but most of the paint has disappeared. Inside the floors are of wide, oak plank. the mantels are high and wide, painted white. The panelled walls are very elaborately carved in a four leaf design. Over the doorways and mantels are arches. At the ends of these arches are the same designs that will be found elsewhere in the rooms. In the center of the ceiling of the room that was used for the parlor, is a gorgeous medallion of leaf design or pattern. The panelling is in a carved shape with leaf design at the corners of the high windows and other corners. All doors are four panelled. The dining room has a built-in cupboard with wide hinges, wide locks and brass knobs. There are eight rooms and three halls. The sills are handhewn, put together with wooden pegs and hand-made nails. In the back yard are the remains of the old kitchen. In the front yard are a number of large, oak trees and lots of tree boxwood, not fenced. Col. Wm. Martin was one of Virginia's most gifted orators. He was elected a member of the Legisature before he was twenty-one years old. Some members of that body objected to his being seated because of his youth, but his reply, an oration unlooked for, overwhelmed the opposition and he became famous. He was later elected several times Commonwealth's Attorney for Henry County. Informants; Mr. James Hairston, Martinsville,Virginia owner. Mr. Wm. Booker, Martinsville, Virginia, R.F.D., tenant. Deed Book: 13 page 433, 21 page 702, 28 page 104, 34 page 113, 35 page 469 and 476. Will Book: 12 page 71. History of Henry County, by Miss J. A. P. Hill, page 225.